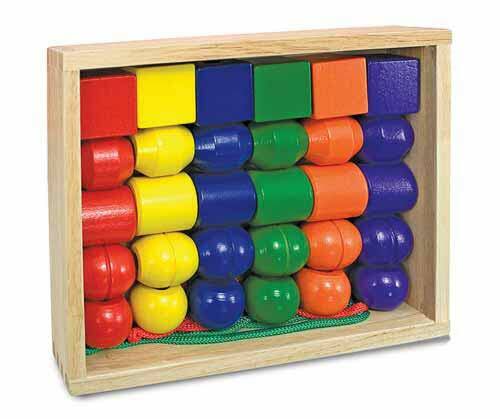 It's pretty simple: a box of 30 large wooden beads in six colours & six different shapes with two long shoe laces. Kids can put the beads on the string, stack them like blocks, stick them on their fingers. Playing with them can work on hand-eye coordination, fine motor skills as well as cognitive & visual perception skills. You could work on colours, shapes & counting with them. The age on the box says three & up, but the beads are so big that I wouldn't worry about them being a choking hazard for younger children. The beads come with fairly minimal packaging in a wooden tray that can be used to store them later. Sprout liked sorting them & putting them back in the tray. He also often pops them on his fingers like puppets--they have very large holes through them. The beads are a classic toy that leaves everything to the child's imagination--no trademarked characters, non-gender specific & they don't have a really narrow range of ways to play with them. The beads are made in China, but Melissa & Doug tests their toys & paint to be sure that they are safe & non-toxic. I found them at Lely's Toys in Kingsgate Mall, but tons of online retailers like Amazon & Chapters or Melissa & Doug's website. *I didn't get any compensation to write this post.